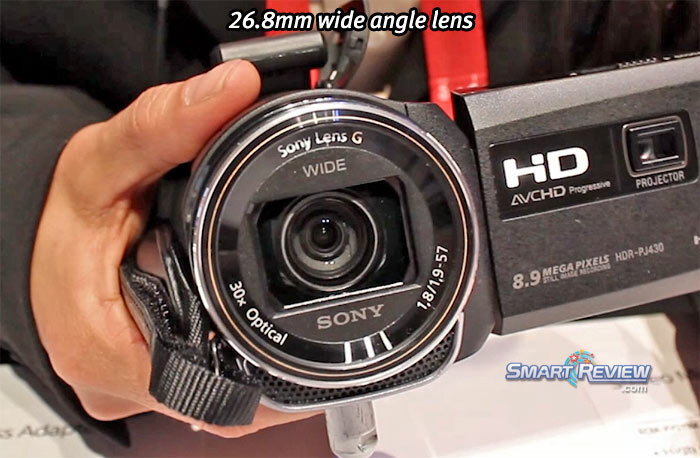 **New for 2013** Sony’s mid-range dual flash memory based high definition camcorder has 32GB of internal memory and a built in Projector. Advanced features include an ultra-smooth 60 progressive frames/second (1080p @ 60fps) recording mode, it can also record at 24p (1080p @24fps), the same frame rate as movie film. The PJ430V Features a new wide angle G-Lens (26.8mm) with 30x Optical zoom. This camcorder has Sony’s best premium Balanced Optical SteadyShot™ image stabilization to prevent blurring when shooting video. Compact size. Other features: 8.9 megapixel still images, 3.0 inch LCD touch-screen (230K pixels), built-in GPS to geotag your video or pictures. The HDR-PJ430V has a 1/3.91-inch back-illuminated “Exmor R” CMOS sensor for better low light performance. BIONZ™ Image processor improves the speed and quality, as well as improving battery life. Full HD (1920 x 1080) video capture. The newly improved 13 lumen Built-in Projector can project your videos on a wall for viewing up to the size of a 100-inch diagonal screen. New for 2013 is a projector HDMI input, which allows you to project content from your tablet, laptop, or smartphone by plugging them into the camcorder. The PJ430V uses the AVCHD compression format (up to 24Mbps) to record high definition video. The 60p mode records at an even higher 28Mbps using AVCHD progressive compression. Hookup directly to an HDTV through HDMI output. Dolby® Digital 5.1 Surround Sound Microphone for best sound. USB 2.0 interface. Dedicated microphone and headphone inputs. Multi interface accessory shoe for external microphones, WiFi, and lights. The built-in 32GB memory will record approximately 2 hours of video at maximum HD quality (more with memory cards). Face Detection, Smile Shutter, External Microphone Jack and headphone jack. The memory slot can take either Memory Stick PRO Duo™ media or SDHC flash memory cards. 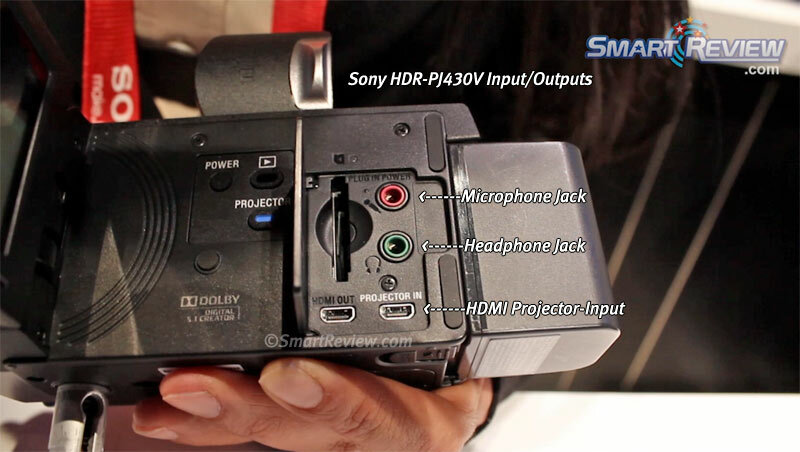 Smart-Review Commentary: For 2013, Sony has introduced a feature packed consumer camcorder with Sony’s best Balanced Optical Steadyshot. The Full HD 60p mode will make the video appear more real and fluid. We previewed the built-in projector function at CES 2013 Electronics Show, and the projector does a great job for its size. We saw it projected to its full 100-inch diagonal size on a screen. 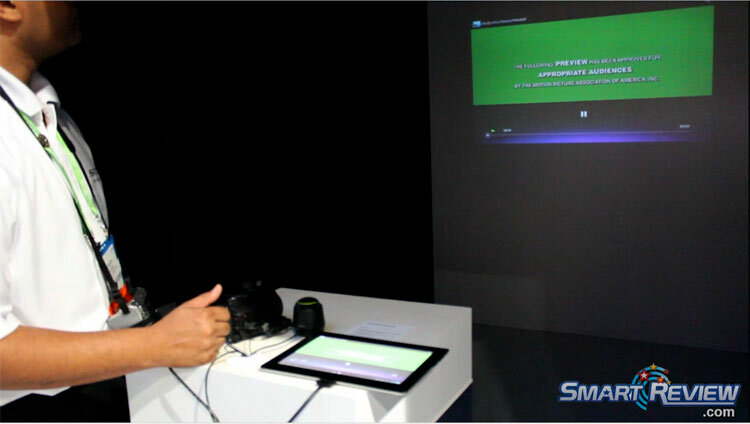 It now has the ability to project content from your tablet, laptop, or smartphone as well as the camcorder with the new projector HDMI input feature. The HDR-PJ430V has a 32GB flash drive for recording hours of video and a memory slot for even more recording. 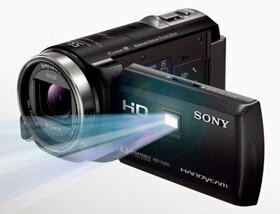 This camcorder has been designed for low light conditions using its Back-Illuminated 1/3.91-inch Exmor R CMOS imager. The PJ430V can take up to 8.9 megapixel still images. This camcorder has the latest optical image stabilization technology: Balanced Optical SteadyShot™ to remove blurring during handheld use which will come in handy when using its 30x optical and 55x extended zoom. The built-in external microphone jack will allow you to use external microphones or you can use the built-in Dolby 5.1 channel surround sound mic. The built-in GPS can tag your video so you know where you were (exactly) when it was shot, and show your location on the LCD screen. The Sony HDR-PJ430V’s Tracking Focus feature allows you to touch a subject on the LCD touchscreen and have the camcorder follow it and keep it in focus. The PJ430 has a built in USB cable for charging and transferring video to your computer. A new feature Clear Voice with Face Detection will switch to an audio mode that enhances the human voice when it detects a face. This camcorder also uses the highest possible AVCHD compression quality (24Mbps) when recording regular HD, and 28Mbps for the 60p mode. The 26.8mm wide angle lens will be important to you when taking group shots, panoramas, and indoor shots. The memory card slot can now accommodate SDHC cards as well as Memory Stick Pro Duo cards. the new MP4 recording option produces smaller file sizes that can be shared online. This is one of the least expensive models with Balanced Optical Steadyshot™ . We previewed this feature at CES 2013, and it is much more effective at reducing blurring, especially in low light and long telephoto shots than normal camcorders (see our video above). This mid-range model is a Smart-Review top pick for 2013. If you upgrade to the HDR-PJ810, you get Sony’s best premium Balanced Optical SteadyShot™ Image Stabilization, upgrades to a 3.0 inch high resolution LCD screen (921,000 pixels), Adds a Dolby® Digital 5.1 surround sound microphone, brighter projector with HDMI input, adds a viewfinder, upgrades to 24.5 megapixel photos, adds manual dial and control, adds built-in WiFi & NFC with free APP for smartphone or tablet.